اکبر فخرآبادی, حمیدرضا, قیدرخلجانی, جعفر, قدسی پور, سید حسن. (1395). مدل‌سازی رقابت در مسئله هماهنگی یک زنجیره تامین سه سطحی. 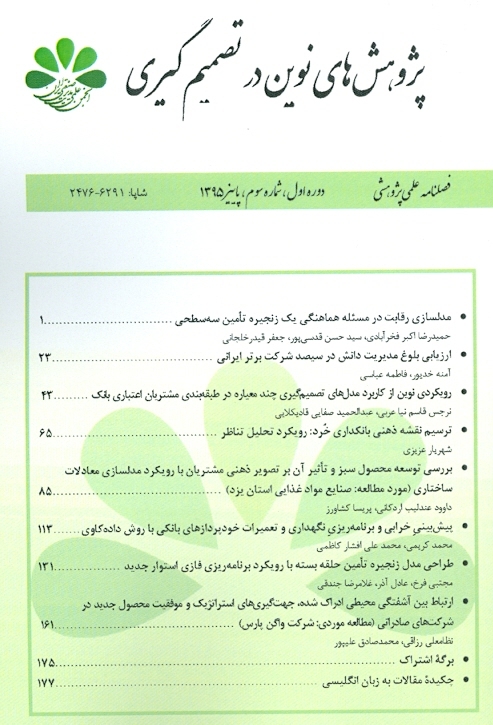 پژوهش های نوین در تصمیم گیری, 1(3), 1-22. حمیدرضا اکبر فخرآبادی; جعفر قیدرخلجانی; سید حسن قدسی پور. "مدل‌سازی رقابت در مسئله هماهنگی یک زنجیره تامین سه سطحی". پژوهش های نوین در تصمیم گیری, 1, 3, 1395, 1-22. اکبر فخرآبادی, حمیدرضا, قیدرخلجانی, جعفر, قدسی پور, سید حسن. (1395). 'مدل‌سازی رقابت در مسئله هماهنگی یک زنجیره تامین سه سطحی', پژوهش های نوین در تصمیم گیری, 1(3), pp. 1-22. اکبر فخرآبادی, حمیدرضا, قیدرخلجانی, جعفر, قدسی پور, سید حسن. مدل‌سازی رقابت در مسئله هماهنگی یک زنجیره تامین سه سطحی. پژوهش های نوین در تصمیم گیری, 1395; 1(3): 1-22. هدف از این مقاله بررسی یک زنجیره‌ی تأمین سه سطحی شامل دو خردهفروش، یک تولید کننده و یک تامینکننده و هماهنگ کردن تصمیمات هر یک از اعضا در زمینه قیمت‌گذاری و موجودی، به صورت موثر و کارا، با استفاده از نظریه بازی است. در این زنجیره در سطح خرده‌فروشی بین خرده‌فروش‌ها رقابت وجود دارد و آن‌ها برای به دست آوردن سهم بیشتر از بازار با یکدیگر رقابت می-کنند. مدل‌سازی موجودی یک زنجیره‌ی تأمین چند سطحی و فرموله کردن بازی اعضاء برای تعیین قیمت و دوره‌ی جایگزینی موجودی، رویکرد اصلی این مقاله است. در این پژوهش از روش ضریب صحیح به عنوان روش جایگزینی موجودی ماده‌ی خام و محصول استفاده شده و بازی استکلبرگ-نش سه سطحی آشیانه‌ای برای مدل‌کردن این مسئله‌ی بهینه‌سازی به‌کار رفته است. در این بازی دو خرده-فروش بازی نش سطح پایین را تشکیل می‌دهند، سپس این دو خرده‌فروش به عنوان یک گروه، بازی استکلبرگ سطح میانی را با تولیدکننده بازی می‌کنند و خرده‌فروش‌ها و تولیدکننده به عنوان یک گروه بازی استکلبرگ سطح بالا را با تأمین‌کننده انجام می‌دهند. This paper concerns studying a three-level supply chain and coordinating price and inventory decisions using game theory. In the retailing level, competing exist between retailers and they compete each other to gain higher demand. Demand is deterministic. The main challenge is modeling a multi-level supply chain and formulating the game between players to determine price and replenishment period. Integer multiplier method adopted as replenishment mechanism and three-level nested Stackelberg-Nash game used to formulate the optimization problem that produces a three-level programming model. Retailers formulate the bottom-level Nash game, the whole retailers play the middle-level Stackelberg game with manufacturer, and both levels as a group formulate the top-level Stackelberg game with supplier. Questions that answered at the end are for supplier; (1) what is the optimal price for raw material sold to manufacturer? In addition (2) how frequent should the raw material procurement take place? For manufacturer: (1) what is the optimal product wholesale price? In addition (2) how frequent should the production process take place? For each retailer: (1) what is the optimal price for products sold to market? and (2) how frequent should the product procurement take place? Amoozad Mahdiraji H., Jaafarnejad A., Moddares Yazdi M., Mohaghar, A. (2014) "Cooperation modeling for unlimited three echelon supply chain: Game theory approach", The Modares Journal of Management Research in Iran, 18(1): 171–191. Pyke D. F., CohenM. A. (1993) "Performance characteristics of stochastic integrated production-distribution systems", European Journal of Operational Research, 68(1): 23–48. Banerjee A., Kim S.L. (1995) "An integrated JIT inventory model", International Journal of Operations & Production Management, 15(9): 237–244. Jaber M. Y., Osman I. H., Guiffrida A. L. (2006) "Coordinating a three-level supply chain with price discount, price dependent demand, and profit sharing", International Journal of Integrated Spply Management, 2(1-2): 28–48. Ding D., Chen J. (2008) Coordinating a three level supply chain with flexible return policies, Omega, 36(5): 865–876. Jaber M. Y., Bonney M., Guiffrida A. L. (2010) "Coordinating a three-level supply chain with learning-based continuous improvement", International Journal of Production Economics, 127(1): 27–38. http://doi.org/10.1016/j.ijpe.2010.04.010. He Y., Zhao X. (2012) "Coordination in multi-echelon supply chain under supply and demand uncertainty", International Journal of Production Economics, 139(1): 106–115. http://doi.org/10.1016/j.ijpe.2011.04.021. Khouja M. (2003) "Optimizing inventory decisions in a multi-stage multi-customer supply chain", Transportation Research Part E: Logistics and Transportation Review, 39(3): 193–208. http://doi.org/10.1016/S1366-5545(02)00036-4. Ben-Daya M., Al-Nassar A. (2008) "An inventory production system in a three-layer supply chain", Production Planning & Control, 19(2): 97–104. Hajiaghaei-keshteli M., Sajadifa S. M. (2010) "Deriving the cost function for a class of three-echelon inventory system with N-retailers and one-for-one ordering policy", International Journal of Advanced Manufacturing Technology, 50:343–351. Yang, D., Jiao, J. (Roger), Ji Y., Du G., Helo P., Valente A. (2015), "Joint optimization for coordinated configuration of product families and supply chains by a leader-follower Stackelberg game", European Journal of Operational Research, 246(1): 263–280. Taleizadeh A. A., Noori-daryanM. (2015) "Pricing, inventory and production policies in a supply chain of pharmacological products with rework process: A game theoretic approach", Operational Research, 1–27. Sadigh A. N., Chaharsooghi S. K., Sheikhmohammady M. (2016) "A game theoretic approach to coordination of pricing, advertising, and inventory decisions in a competitive supply chain", Journal of Industrial and Management Optimization, 12(1): 337–355. Jalali G., Shahanaqhic K. (2015) "The establishment of financial model in order to solve the dispute in the cooperative governmental- private contracts by using game theory", The Modares Journal of Management Research in Iran, 18(3): 1–24. Liu B. (1998) "Stackelberg-nash equilibrium for multilevel programming with multiple followers using genetic algorithms", Computers & Mathematics with Applications, 36(7): 79–89. http://doi.org/10.1016/S0898-1221(98)00174-6. Parthasarathi G., Sarmah S. P., Jenamani M. (2011) "Supply chain coordination under retail competition using stock dependent price-setting newsvendor framework", Operational Research, 11(3): 259–279. http://doi.org/10.1007/s12351-010-0077-z. Sinha S., Sarmah S. P. (2010) "Coordination and price competition in a duopoly common retailer supply chain", Computers and Industrial Engineering, 59(2): 280–295. Yao Z., Leung S. C. H., Lai, K. K. (2008) "Analysis of the impact of price-sensitivity factors on the returns policy in coordinating supply chain", European Journal of Operational Research, 187(1): 275–282. Viswanathan S., Wang Q. (2003) "Discount pricing decisions in distribution channels with price-sensitive demand", European Journal of Operational Research, 149: 571–587.